Ned Vizzini (born Edison Price Vizzini, April 4, 1981 – December 19, 2013) was an American writer. He was the author of four books for young adults including It's Kind of a Funny Story, which NPR named #56 of the "100 Best-Ever Teen Novels"  and which is the basis of the film of the same name. Vizzini suffered from depression, spending time in a psychiatric ward in his early 20s, and authoring several works about the illness. He was found dead in his native Brooklyn, New York after an apparent suicide from a fall, aged 32. Ned Vizzini grew up primarily in the Park Slope neighborhood of Brooklyn in New York City. He attended Stuyvesant High School in Manhattan, graduating in 1999. Vizzini's characters and situations are said to be based upon his time spent at Stuyvesant. Vizzini's first published work was an essay he submitted to the New York Press, an alternative newspaper, about winning honorable mention at the 1996 Scholastic Art & Writing Awards. As a freelance writer for the paper, he wrote about everything from family vacations to getting drunk in the street with other kids. The success of Vizzini's work earned him an invitation to contribute a teen-focused article to the New York Times Magazine. In May 1998, Vizzini's essay "Teen Angst? Nah!" appeared in The New York Times. Following this, several of his New York Press columns became the core of his first book, Teen Angst? Naaah.... which is a memoir of his teenage years. It is a collection of short stories, most of which were originally published in The New York Press and The New York Times Magazine. The book is broken down by years covering junior high through high school and beyond. Vizzini attended Hunter College, located in Manhattan. In 2004 his first novel Be More Chill was published. A review for the New York Times Book Review said that Be More Chill, which is about a high school student named Jeremy Heere who gets a supercomputer pill in his brain that makes him cool, "is so accurate that it should come with a warning." Others have criticized the book for its language and lack of a clear moral. Be More Chill was later adapted into a musical in summer 2015 with music and lyrics by Joe Iconis and premiered at New Jersey’s Two River Theatre. Three years later, an Off-Broadway production opened at the Signature Theater in New York, followed by a Broadway premiere the following February. In 2006 Vizzini's second novel It's Kind of a Funny Story was published. It is based on his five-day stay in Brooklyn's Methodist Hospital psychiatric ward. The book recounts fifteen-year-old Craig Gilner's battle with suicidal depression as a result of a taxing school year at Manhattan's Executive Pre-Professional High School that exacerbates his feeling of social inadequacy. In 2012 Vizzini's third novel The Other Normals was published. It is an "alternative fantasy" about a teenager who falls into a fantasy world that is the basis of his favorite role-playing game. With Nick Antosca, Vizzini wrote two episodes of the 2012 season of MTV's supernatural drama Teen Wolf. In 2013, House of Secrets, the first novel in a middle grade fantasy series by Vizzini and filmmaker Chris Columbus, was published. It debuted on the New York Times bestseller list, where it remained for four weeks. Entertainment Weekly gave the book an "A-" review. His essays and criticism appeared in The New York Times, The Los Angeles Review of Books, and Salon. Vizzini spoke at schools and libraries around the world about mental health, writing, and how students can use writing as a medicine for mental health. He spoke at UCLA; The Dalton School; the Brooklyn, New York, and Chicago Public Libraries; Murray State University; NYU; The National Council of Teachers of English; and a Master's Tea at Yale. Vizzini and Antosca were story editors on ABC's 2013 drama series Last Resort. They are the credited writers of the episode "Nuke It Out." From 2006 to 2012 Vizzini facilitated a writing workshop for local teenagers. The workshops were held monthly in a Park Slope Barnes & Noble. The teens who attended had the chance to have their work published on the group's blog, "Give Us Money." Vizzini, who often spoke and wrote about his struggles with severe clinical depression, died by suicide on December 19, 2013 in Brooklyn, New York, at the age of 32. The New York City chief medical examiner's office said he suffered blunt impact injuries. The writer's brother, Daniel, told reporters that Vizzini had jumped off the roof of the building where their parents live. ^ a b Yardley, William (December 20, 2013). "Ned Vizzini, 32, Dies; Wrote Teenage Novels". New York Times. Retrieved December 21, 2013. ^ "Best Young Adult Novels, Best Teen Fiction, Top 100 Teen Novels : NPR". Retrieved 23 April 2013. ^ 'Young adult' author whose memoir about depression was made into Zach Galifianakis film commits suicide aged 32 Daily Mail, 20 December 2013. Retrieved 21 December 2013. ^ "Teen Angst Author and Hunter College Student Ned Vizzini to Speak About Writing and Publishing At May 1 Book Signing" (Press release). April 2002. Archived from the original on August 14, 2007. Retrieved November 1, 2007. ^ Catherine Wigginton (November 7, 2006). "Too Hot to Handle". Village Voice. Retrieved April 28, 2008. ^ "Ned Vizzini | FAQ". What are ten important dates in your life and what happened on those dates?. Archived from the original on 24 May 2013. Retrieved 23 April 2013. ^ a b c d "Ned Vizzini (1981-)". Something About the Author. 179: 196–198. 2008. ^ Vizzini, Ned. "Advice; Teen Angst? Nah! - New York Times". The New York Times. Retrieved April 23, 2013. ^ Vizzini, Ned (2002). Teen Angst? Naaah... Laurel Leaf. ISBN 044023767X. ^ "Goodreads | Be More Chill by Ned Vizzini - Reviews, Discussion, Bookclubs, Lists". Retrieved April 23, 2013. ^ Healy, Cat. "The Other Normals « Beyond Books". Archived from the original on 20 January 2013. Retrieved 23 April 2013. ^ ""Teen Wolf" Restraint (TV episode 2012) - IMDb". Retrieved April 23, 2013. ^ Fowler, Tara. "House of Secrets Review | Book Reviews and News". Retrieved April 23, 2013. ^ Vizzini, Ned. "Children's Books - The Cardturner - By Louis Sachar - NYTimes.com". Retrieved April 23, 2013. ^ Vizzini, Ned. "Los Angeles Review of Books - A Grosser Power: A Contrarian Look At The Hunger Games". Archived from the original on April 19, 2013. Retrieved April 23, 2013. ^ Vizzini, Ned. ""Game of Thrones" parenting lessons - Salon.com". Archived from the original on August 5, 2012. Retrieved April 23, 2013. ^ "How Not to Go Crazy in College". Gotham Artists. Retrieved February 26, 2012. ^ ""Last Resort" Nuke It Out (TV episode 2012)". Retrieved April 23, 2013. ^ "Teen Writing Workshop with Author Ned Vizzini". Park Slope Patch. Retrieved 6 January 2014. ^ "Teen Writing Workshop with Author Ned Vizzini - Barnes & Noble Park Slope". Brooklyn parent. Retrieved 6 January 2014. ^ Kellogg, Carolyn. "Writer Ned Vizzini has died at 32". Los Angeles Times. Retrieved 20 December 2013. ^ Yardley, William (December 20, 2013). "Ned Vizzini, 32, Dies; Wrote Teenage Novels". The New York Times. ^ "Ned Vizzini & wife Sabra". Daily E News. December 2013. Retrieved 2013-12-15. 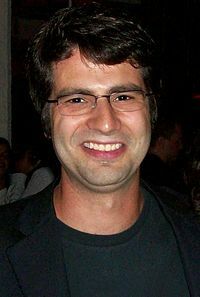 Wikimedia Commons has media related to Ned Vizzini. This page was last edited on 19 April 2019, at 22:44 (UTC).